This article is about the poem. For the 2009 film, see Invictus (film). For other uses, see Invictus (disambiguation). 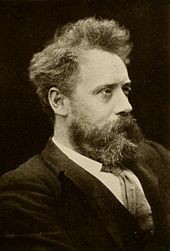 A portrait of William Ernest Henley by Leslie Ward published in Vanity Fair 26 November 1892. Originally, the poem was published with no title. The second edition of Henley's Book of Verses added a dedication "To R. T. H. B. "—a reference to Robert Thomas Hamilton Bruce (1846–1899), a successful Scottish flour merchant, baker, and literary patron. The 1900 edition of Henley's Poems, published after Bruce's death, altered the dedication to "I. M. R. T. Hamilton Bruce (1846–1899)" (I. M. standing for "in memoriam"). The poem was reprinted in nineteenth-century newspapers under a variety of titles, including "Myself", "Song of a Strong Soul", "My Soul", "Clear Grit", "Master of His Fate", "Captain of My Soul", "Urbs Fortitudinis", and "De Profundis". The established title "Invictus", Latin for "unconquered", was added by editor Arthur Quiller-Couch when the poem was included in The Oxford Book of English Verse (1900). When Henley was 16 years old, his left leg required amputation due to complications arising from tuberculosis. :16 In the early 1870s, after seeking treatment for problems with his other leg at Margate, he was told that it would require a similar procedure. In August 1873 he chose instead to travel to Edinburgh to enlist the services of the distinguished English surgeon Joseph Lister,:17–18 who was able to save Henley's remaining leg after multiple surgical interventions on the foot. While recovering in the infirmary, he was moved to write the verses that became "Invictus". A memorable evocation of Victorian stoicism—the "stiff upper lip" of self-discipline and fortitude in adversity, which popular culture rendered into a British character trait—"Invictus" remains a cultural touchstone. In a speech to the House of Commons on 9 September 1941, Winston Churchill paraphrased the last two lines of the poem, stating "We are still masters of our fate. We still are captains of our souls." While incarcerated at Robben Island prison, Nelson Mandela recited the poem to other prisoners and was empowered by its message of self-mastery. The Burmese opposition leader and Nobel Peace laureate  Aung San Suu Kyi stated, "This poem had inspired my father, Aung San, and his contemporaries during the independence struggle, as it also seemed to have inspired freedom fighters in other places at other times." The poem was read by US POWs in North Vietnamese prisons. James Stockdale recalls being passed the last stanza, written with rat droppings on toilet paper, from fellow prisoner David Hatcher. The line "bloody, but unbowed" was the Daily Mirror's headline the day after the 7 July 2005 London bombings. The poem's last stanza was quoted by US President Barack Obama at the end of his speech at Nelson Mandela's memorial service (10 December 2013) in South Africa and published on the front cover of the 14 December 2013 issue of The Economist. The poem was chosen by Oklahoma City bomber Timothy McVeigh as his final statement before his execution. Jerry Kramer recited the poem during his National Football League (NFL) Pro Football Hall of Fame (HOF) induction speech. The perpetrator of the Christchurch mosque shootings included the poem in his manifesto. C. S. Lewis, in Book Five, chapter III (The Self-Sufficiency of Vertue) of his early autobiographical work The Pilgrim's Regress (1933) included a quote from the last two lines (paraphrased by the character "Vertue"): 'I cannot put myself under anyone's orders. I must be the captain of my soul and the master of my fate. But thank you for your offer.'. In Oscar Wilde's De Profundis letter in 1897, he reminisces that 'I was no longer the Captain of my soul'. In W.E.B. Du Bois's The Quest of the Silver Fleece, the last stanza is sent anonymously from one character to another to encourage him to stay strong in the face of tests to his manhood. In the 1942 film Casablanca, Captain Renault, an official played by Claude Rains, recites the last two lines of the poem when talking to Rick Blaine, played by Humphrey Bogart, referring to his power in Casablanca. After delivering this line, he is called away by an aide to Gestapo officer Major Strasser. In the 1960 film Sunrise at Campobello, the character Louis Howe, played by Hume Cronyn, reads the poem to Franklin D. Roosevelt, played by Ralph Bellamy. The recitation is at first light-hearted and partially in jest, but as it continues both men appear to realize the significance of the poem to Roosevelt's fight against his paralytic illness. The Invictus Games; an international Paralympic-style multi-sport event created by Prince Harry in which wounded, injured or sick armed services personnel and their associated veterans take part in sport, has featured the poem in its promotions. Prior to the inaugural games in London in 2014, entertainers including Daniel Craig and Tom Hardy, and athletes including Louis Smith and Iwan Thomas, read the poem in a promotional video. In the 1942 film Kings Row, Parris Mitchell, a psychiatrist played by Robert Cummings, recites the first two stanzas of "Invictus" to his friend Drake McHugh, played by Ronald Reagan, before revealing to Drake that his legs were unnecessarily amputated by a cruel doctor. Mandela is depicted in the movie Invictus presenting a copy of the poem to Francois Pienaar, captain of the national South African rugby team, for inspiration during the Rugby World Cup—though at the actual event he gave Pienaar a text of "The Man in the Arena" passage from Theodore Roosevelt's Citizenship in a Republic speech delivered in France in 1910. The line "bloody, but unbowed" was quoted by Lord Peter Wimsey in Dorothy Sayers' 1926 novel Clouds of Witness, in reference to his failure to exonerate his brother of the charge of murder. The last two lines "I am the master of my fate: I am the captain of my soul" are shown in a picture during the 25th minute of the film The Big Short. The line "I am the master of my fate... I am the captain of my soul" is used in Lana Del Rey's song "Lust for Life" featuring The Weeknd. The lyrics are changed from "I" to "we," alluding to a relationship. In the fifth episode of the second season of Archer, "The Double Deuce", Woodhouse describes Reggie as "in the words of Henley, 'bloody, but unbowed'". The poem was recited in an early commercial for the Microsoft Xbox One. In the US TV series The Blacklist episode "Ian Garvey" (No. 13), the eighth episode of the fifth season, Raymond 'Red' Reddington, played by James Spader, reads the poem to Elizabeth Keen, when she wakes up from a ten-month coma. In the US TV series One Tree Hill episode "Locked Hearts & Hand Grenades", the sixth episode of the third season, Lucas Scott, played by Chad Michael Murray, references the poem in an argument with Haley James Scott, played by Bethany Joy Lenz, over his heart condition and playing basketball. The episode ends with Lucas reading the whole poem over a series of images that link the various characters to the themes of the poem. Star Trek: Renegades opens with Lexxa Singh reciting the poem and writing it on the wall of her prison cell. In the US TV series New Amsterdam season 1, episode 2 "Ritual" with Dr. Floyd Reynolds played by Jocko Sims, references the poem while prepping hands for surgery prior to a conversation with his fellow doctor Dr. Laura Bloom played by Janet Montgomery. ^ a b c Henley, William Ernest (1888). A book of verses. London: D. Nutt. pp. 56–57. OCLC 13897970. ^ Henley, William Ernest (1891). A book of verses (Second ed.). New York: Scribner & Welford. pp. 56–7. ^ Henley, William Ernest (1900). Poems (Fourth ed.). London: David Nutt. p. 119. ^ "Myself". Weekly Telegraph. Sheffield (England). 1888-09-15. p. 587. ^ "Song of a Strong Soul". Pittsburgh Daily Post. Pittsburgh, PA. 1889-07-10. p. 4. ^ "My Soul". Lawrence Daily Journal. Lawrence, KS. 1889-07-12. p. 2. ^ "Clear Grit". Commercial Advertiser. Buffalo, NY. 1889-07-12. p. 2. ^ "Master of His Fate". Weekly Times-Democrat. New Orleans, LA. 1892-02-05. p. 8. ^ "Captain of My Soul". Lincoln Daily Call. Lincoln, NE. 1892-09-08. p. 4. ^ "Urbs Fortitudinis". Indianapolis Journal. Indianopolis, IN. 1896-12-06. p. 15. ^ "De Profundis". Daily World. Vancouver, BC. 1899-10-07. p. 3. ^ "English professor Marion Hoctor: The meaning of 'Invictus'". CNN. 2001-06-11. Retrieved 2009-06-21. ^ Wilson, A.N. (2001-06-11). "World of books". Daily Telegraph. Retrieved 2009-12-14. ^ a b Goldman, Martin (1987). Lister's Ward. Adam Hilger. ISBN 0852745621. ^ Cohen, Edward (April 2004). "THE SECOND SERIES OF W. E. HENLEY'S HOSPITAL POEMS". Yale University Library Gazette. 78 (3/4): 129. JSTOR 40859569. ^ "Famous Quotations and Stories". Winston Churchill.org. ^ Stockdale, James (1993). "Courage Under Fire: Testing Epictetus's Doctrines in a Laboratory of Human Behavior" (PDF). Hoover Institution, Stanford. ^ "The Economist Dec 14th, 2013". Retrieved 10 January 2014. ^ Quayle, Catherine (June 11, 2001). "Execution of an American Terrorist". Court TV. ^ Cosby, Rita (June 12, 2001). "Timothy McVeigh Put to Death for Oklahoma City Bombings". FOX News. Retrieved April 15, 2008. ^ "Green Bay Packers". www.facebook.com. Retrieved 2018-08-06. ^ Dominic Sandbrook (30 January 2010). "British leaders: they're not what they were". The Daily Telegraph (UK). ^ Sayers, Dorothy (1943). Clouds of Witness. Classic Gems Publishing. p. 28. Retrieved 2014-05-15. ^ Wylie, Elinor (1932). "Let No Charitable Hope". Poetry Society of America.